What would you give to live forever? Elijah Brighton wants to become an ascender—human/machine hybrid—after all, they’re smarter, more enlightened, and achingly beautiful. But Eli is a legacy human, preserved for his unaltered genetic code, just like the rainforest he paints. When a fugue state possesses him, Eli miraculously lands a sponsor for the creative Olympics. If he masters the fugue, he’ll win the right to ascend, bringing everything he’s yearned for within reach… including his beautiful ascender patron. But when Eli arrives at the Games, he finds the ascenders are playing games of their own. Everything he knows starts to unravel… until he’s running for his life and wondering who he truly is. 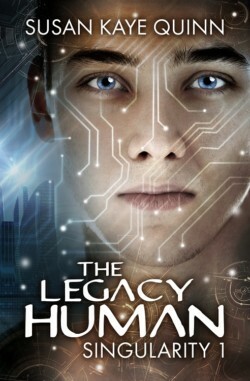 The Legacy Human explores the intersection of mind, body, and soul in a post-Singularity world.